Vitamins are absolutely necessary for all animals, and those most exposed to deficiencies are, naturally, those that are bred in captivity and can not freely choose their diet. In cage birds, despite providing them with a varied diet, deficiencies of some essential vitamins are often produced. Even if no symptoms of vitamin deficiency appear, these deficiencies entail a greater sensitivity to the different diseases and cause frequent reproductive anomalies: sterility, poor fertilization, embryonic mortality, deficient hatching, of which the breeder often does not explain the reason. It is difficult to determine exactly an avitaminosis that, on the other hand, is usually multiple. 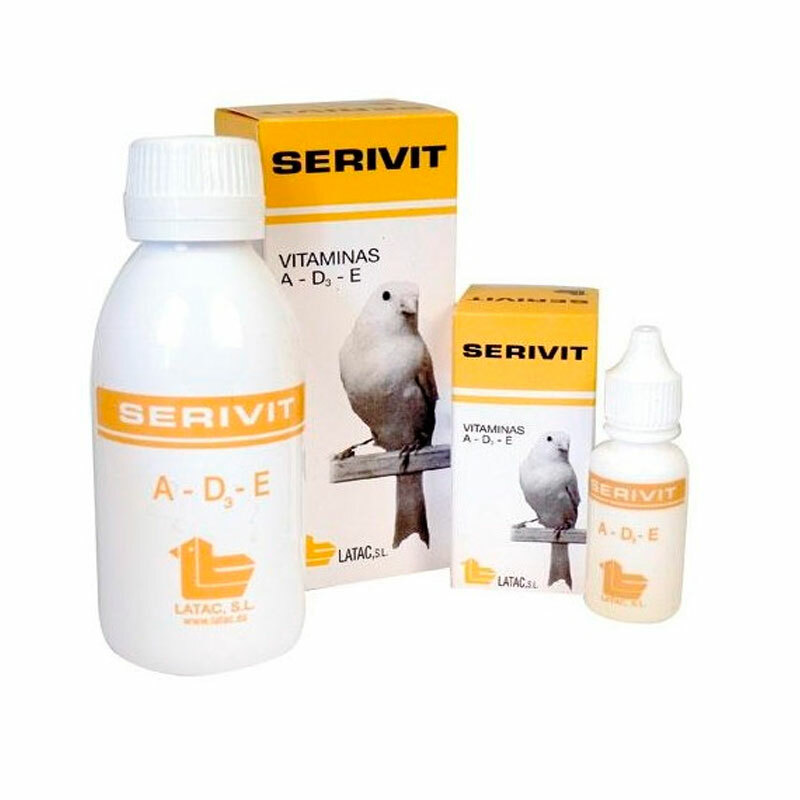 Therefore, the most indicated is the regular administration of SERIVIT A-D3-E essential vitamins for the biological balance of birds. Species of destination: Canaries, goldfinches, linnets, nymphs, lovebirds and pigeons. Mix 4 to 6 drops of SERIVIT in a running water trough (50 ml) or 50 g. of pasta or feed. For three weeks before mating and until the end of the laying, alternating 7 days of treatment with another 7 days of rest. For larger quantities, the 150 ml container is recommended and the dose is the content of a stopper for two liters of water. Composition: Lactose 2% and sucrose 2% Additives (Composition per 100 ml): Vitamin A (E-672) 600,000 U.I . ; Vitamin D3 (E-671) 100,000 U.I . ; Vitamin E (α Trocopherol acetate (E-307)) 250 mg.